Ask fellow campers about "Happy Together RV Resort" and nearby attractions. I must start by saying that I have never been charged so much to use a credit card in an RV park. We have been full-timers for 5 years and the most we had ever been charged in the past was $2.50. This park charges 3% which on $425 comes out much more. Amenities at this park are almost non-existent. Although they advertise "free" wifi, it does not exist at your site. When we complained, we were told to go to the activity room. Unacceptable! No pool, no hot tub, no wifi at the site, very small exercise room and a small activity room is all. 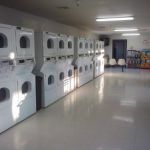 We were told by neighbors that if you use the washer/dryer in your rig, the park charges an additional amount per month. Because the water is so bad at this park, I was hesitant to even wash dishes, much less clothes. Another person in the park told us if we didn't have a water softener we would have to replace our faucets after using this water. Unacceptable! Moved to another park in the area that is $150 less per month and has much better water and many more activities. This park is over priced for what you get. We do not recommend. 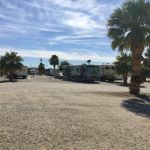 We camped at Happy Together RV Resort in a Fifth Wheel. Our 3rd month here. This is the cleanest rv park we have ever stayed at. The hosts are extremely gracious and generous making sure everyone is "Happy Together" and welcome here. There is something to do at the clubhouse everyday including games with great prizes. We will definitely be back next year to spend our winter at Happy Together. We camped at Happy Together RV Resort in a Fifth Wheel. Casinos nearby, Walmart not far, country setting with all conveniences within minutes. My husband and I and our two dogs really enjoyed staying here Last month. It's a small family operation with friendly and organized owners. The park was not packed so there was room between Rv's to enjoy sitting outside and waving to folks as they went by. Showers were always clean and the water pressure good. The water took a while to get warm but not too long. Just turned on the hot water before undressed and by the time I got in it was warm. Laundry room was always clean and the washers and dryers worked. The cost for wash was $2 and dry was $1.25. I really liked the events held in the clubhouse like potluck dinner, wii bowling, bingo, afternoon tea party, and exercise classes. I also enjoyed the RV cooking class that was held outside at one of the RV sites and line dancing that was held By the picnic tables. For the dogs we were able to walk them off leash in the farm field next-door and on leash around resort. The pet area is a bit small for our medium-size dogs to run around but big enough for them to do their business off leash in a fenced area. No grass since this is a desert area but plenty of bushes around the perimeter and palm trees scattered throughout. The owner seems to take pride in this place as I saw him making rounds regularly tending to the young trees, checking empty sites and chatting with guests about events for the day and making sure we're happy. I expect he will be upgrading more since he took over this place in 2017. Paving the road, increase the WiFi and adding a store with RV supplies and good food would be a plus. We use our Verizon Jetpack when checking accounts online or watch videos but WiFi is good for general internet. I also like that they don't allow any riffraff like some places where half of the RVs are run down and the residents unfriendly. I wish it was less than 100 degrees in the summer then I'd stay here all year. I recommend this place to anyone that like a relaxed and friendly place in a small town. We camped at Happy Together RV Resort in a Motorhome. For gamblers there is a casino within walking distance which also has a small café but it closes at 8 PM due to not enough customers. For a bigger casino there is one within 15 minutes drive. For groceries there is a farm within 10 minutes drive where I bought fresh veggies and fruit and eggs and honey. Within 10 minutes there's Safeway, Smith's and a little bit further is a Walmart supercenter. Can get windy sometimes so make sure to stake down your awning. Very clean with big lots in part of the park. Decent fenced in dog park. Super friendly owners. Weekly gatherings make this a nice cozy park to stay in. I would highly recommend this park! 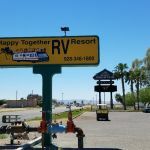 We camped at Happy Together RV Resort in a Motorhome. This RV park is next to a Casino so that's fun! Nearby Needles has a few places to eat and a few discount stores and a Redbox. Oatman is also close and a good place to visit and have lunch. We had a good experience here. I had driven through this park a few years ago before the ownership change and the difference between now and then is stark. Aside from being a gracious and friendly host, the owner has put a lot of effort and money into the park, and it shows. You can tell it is a work in progress, and I like the direction it is headed. Our site was near a wifi repeater, and probably because of that, we had the best wifi service we've ever experienced at a RV park. The sites are laid out in such a manner that you feel as though there is a lot of space between neighbors on the patio side of your rig. Come to think of it, the sites are laid out as buddy sites, but they are staggered so that you don't really notice, unlike another park we recently stayed at. It's true that the driver's side shares a utility island with your neighbor, but that was never an issue for us. We stayed here for only four nights, but would not have minded staying longer. We camped at Happy Together RV Resort in a Motorhome. Initially we were only going to stay 30 days and by the time we leave we will have stayed 3.5 months! The new owners are wonderful. Everyone is friendly and they go out of their way to plan events that everyone can participate in. We liked that it was for 55+ also. The park is kept very clean; washers and dryers are always kept clean; clubhouse is comfortable and the exercise equipment is a real plus. We camped at Happy Together RV Resort in a Fifth Wheel. The owners arranged for us to golf, played bingo and karaoke for concert tickets. We went to Oatman, AZ to see the burros, spent some time in the casinos. Have already made our reservations to return! This park is not a resort in anyway! No pool or spa, exercise equipment is juvenile and not very useful and pool table is toy like. Fire dept is next door and they start the engines every morning at 7:00am, plus go out every night at least once (sirens). Right off of Hwy 95 so a lot of traffic noise. Casino next door has a lot of traffic and loud music noise. Speed bumps are not safe at any speed. Wifi works only if someone isn't streaming Netflix. Laundry is expensive, $2.25 to wash and $1.25 to dry, but dryers heat is so low that the cost is twice that for even light loads. Horseshoe pit only has one post. Some sites are big and wide, but the setup puts the rigs right next to each other, sharing electric, water and sewer pedestals. They try and have functions, but only a few regulars attend. We were told our site was $38 over the phone, but when we arrived our rig was suddenly to big so had to take bigger site for more money. They also wouldn't let us make a reservation, because I didn't want to pay over the phone in case we didn't make it, no refund if you don't show up. My advice is don't stay here, there are many more places to stay that are nicer. We camped at Happy Together RV Resort in a Fifth Wheel. Laughlin across the river. Oatman not far. Came to Campground when the one we were staying at cost more and was not as nice as Happy Together. Owners very friendly with a lot of activities if desired. Lots range from regular to large depending on size of rig or space desired. Close to new Walmart Store and next door to Spirit Mountain Casino. 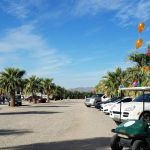 We camped at Happy Together RV Resort in a Fifth Wheel. Visit to Oatman, Quartzsite's Flea Market, Laughlin Casino's and entertainment. Stayed 1 month, rate was 350.00 plus 12 cents a KW, they accept credit cards but there's a 3% fee to use it. Owners very accommodating, go out of their way to help. Clubhouse, Laundry, Restrooms very clean. Activties most nights in the clubhouse, Wi-fi worked well, Cable about 40 channels including HBO and Showtime included in monthly rate. A bit dusty when the wind blows, some traffic noise, Campground is next to the casino. We will stay here again. We camped at Happy Together RV Resort in a Travel Trailer. Stayed for 1 month $325 + 12cents electric ($44). New Ownership as of 2/2017 so older reviews should be corrected.The owners are very friendly, check-in easy. Restrooms, clubhouse, showers all remodeled. Very clean and fresh. New dog run is small, but serves the purpose. Only about 30 sites used, but sites are oversized with plenty of room for slides. No dump site. Park had been closed for a year, but constantly being improved. Will be back. We camped at Happy Together RV Resort in a Travel Trailer. No pool or spa, but park has clubhouse with activities daily, horseshoes, ladderball, ladies tea afternoon, Yoga & Tai Chi every other morning. Very nice place..new owners are very friendly and have added all new amenities. We camped at Happy Together RV Resort in a Motorhome. Very Friendly New management. The park is clean and well maintained. Showers are clean and roomy. The faculties are clean and greatly improved. New washers and dryers. 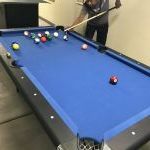 New Clubhouse with activities, friendly environment. We will definitely be back for the winter months. 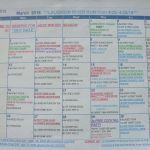 We camped at Happy Together RV Resort in a Motorhome. Close to convenience store, casino and restaurants, and only about 6 miles to town. Sadly run down place. Car wash and laundry are closed. Speed bumps are a little much, but it's a cheap place to stay semi near Havasu and Bullhead cities, and Laughlin NV. We camped at Happy Together RV Resort in a Motorhome. Everything is tired and worn looking. Gravel roads throughout the park with huge speed bumps. We stopped for the night so we could do our laundry and only 2 out of about 20 were in working order. Sites are large and most are pull through, but there is very little landscaping. Wi-Fi is very slow. We camped at Happy Together RV Resort in a Motorhome. Are you affiliated with Happy Together RV Resort ?